AnandTech | Testing SATA Express And Why We Need Faster SSDs – Carpet Bomberz Inc. 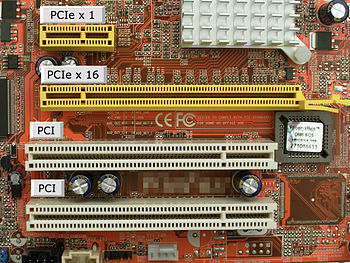 Even a PCIe 2.0 x2 link offers about a 40% increase in maximum throughput over SATA 6Gbps. Like most interfaces, PCIe 2.0 isn’t 100% efficient and based on our internal tests the bandwidth efficiency is around 78-79%, so in the real world you should expect to get ~780MB/s out of a PCIe 2.0 x2 link, but remember that SATA 6Gbps isn’t 100% either (around 515MB/s is the typical maximum we see). The currently available PCIe SSD controller designs are all 2.0 based but we should start to see some PCIe 3.0 drives next year. We don’t have efficiency numbers for 3.0 yet but I would expect to see nearly twice the bandwidth of 2.0, making +1GB/s a norm. via AnandTech | Testing SATA Express And Why We Need Faster SSDs. As I’ve watched the SSD market slowly grow and bloom it does seem as though the rate at which big changes occur has slowed. The SATA controllers on the drives themselves were kicked up a notch as the transition from SATA-1 to SATA-2 gave us consistent 500MB/sec read/write speeds. And that has stayed stable forever due to the inherent limit of SATA-2. I had been watching very closely developments in PCIe based SSDs but the prices were always artificially high due to the market for these devices being data centers. Proof positive of this is Fusion-io catered mostly to two big purchasers of their product, Facebook and Apple. Subsequently their prices always put them in the enterprise level $15K for one PCIe slot device (at any size/density of storage). Apple has come to the rescue in every sense of the word by adopting PCIe SSDs as the base level SSD for their portable computers. Starting last Summer 2013 Apple started released Mac Book Pro laptops with PCIe SSDs and then eventually started designing them into the Mac Book Air as well. The last step was to fully adopt it in their desktop Mac Pro (which has been slow to hit the market). The performance of the PCIe SSD in the Mac Pro as compared to any other shipping computer is the highest for a consumer level product. As the Mac gains some market share for all computers being shipped, Mac buyers are gaining more speed from their SSD as well. So what further plans are in the works for the REST of the industry? Well SATA-express seems to be a way forward for the 90% of the market still buying Windows PCs. And it’s a new standard being put forth by the SATA-IO standards committee. With any luck the enthusiast market motherboard manufacturers will adopt it as fast as it passes the committees, and we’ll see an Anandtech or Tom’s Hardware guide review doing a real benchmark and analysis of how well it matches up against the previous generation hardware. Will PCIe Flash Become Common In Laptops, Desktops?